Are you a Chicken-Salt, or a plain salt person? I am definitely a chicken-salt person! We have a lovely traditional-style fish and chip shop local to us, and when we have takeaway I always ask for chicken-salt ... really, there's nothing better on a hot chip! 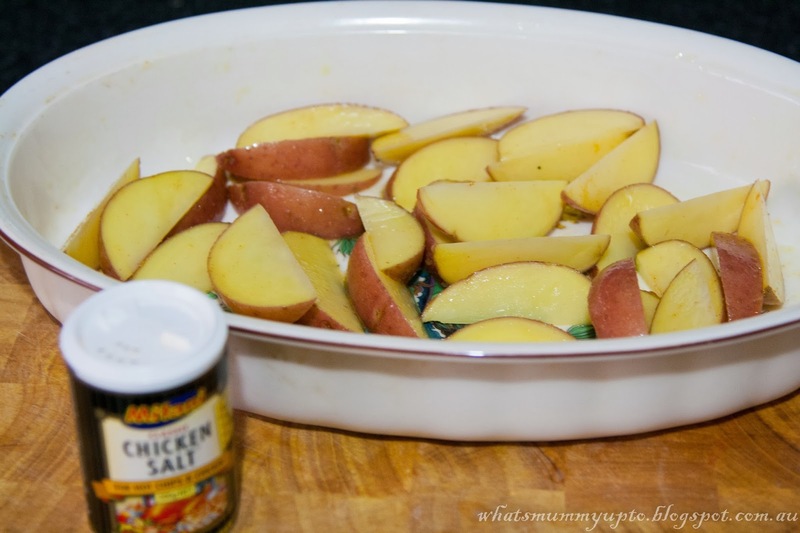 Anyway, this post is thanks to Taryn of Wordstorm who kindly sent me some Mitani Chicken Salt to try and then review. I hadn't really thought of using chicken salt for any other reason than for putting it on my take-away chips until now, but when I received this pack I spent some time pondering what other recipe uses it could have. The great thing about this Chicken Salt is that it's MSG free, so you're not so worried about the mega-thirst that always follows with an MSG-ridden meal. In fact, I found this chicken salt to be quite mild, yet nice just as a different seasoning instead of salt. So I decided I'd show you my really super-simple recipe for the most delicious roast chicken dinner ... well at least, we thought it was pretty yum! 1. 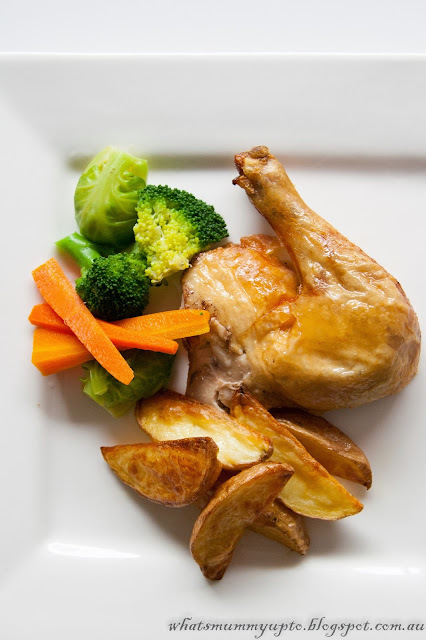 Place your chicken in an oven-proof dish or roasting tray - I love my vintage brown Pyrex that was my Gran's ... it makes me think of her each time I use it! 2. 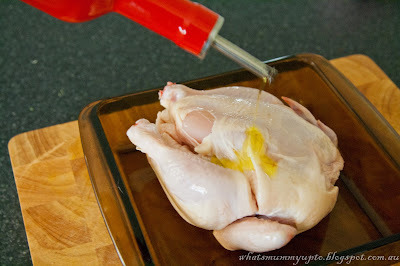 Drizzle about 1 tablespoon of olive oil over the chicken, then spread it over the whole chicken evenly using your hands. 3. 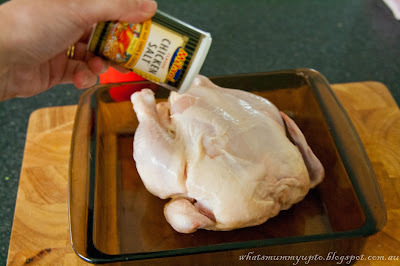 Open the Chicken Salt to the "sprinkle" opening, and sprinkle the whole chicken lightly. All in all you're probably only using a teaspoon or less of chicken salt, which I don't think is all that bad when it gives such a yummy flavour, and you would use at least that much if you were using salt. 4. 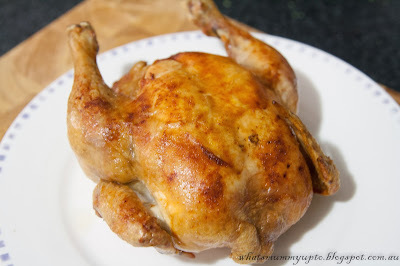 Put the chicken into a hot oven (about 240 degrees C) for 20 minutes. This time in the high heat helps make a beautiful crispy, crackly skin ... Bethany calls is "Chicken Crackling". 5. Meanwhile, grab your potatoes. 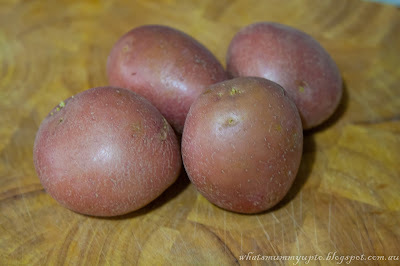 I love these Desiree potatoes for pretty much anything - potato salad, mashed potato, and even roasting. 6. Leaving the skin on (really, why peel them if you don't need to? ... plus, the skin goes crispy and is really tasty too! 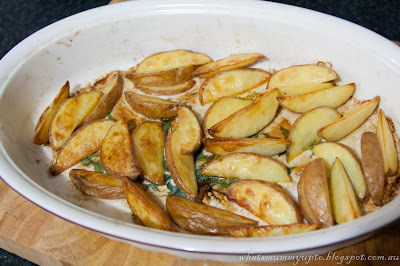 ), cut the potatoes in half, then each half into wedges, then spread them in another oven-proof dish or roasting pan. Drizzle 1 tablespoon of olive oil over the potatoes, then toss them around a little with your hands to coat them well. Then sprinkle them lightly with your chicken-salt. You could also add some fresh or dried herbs if you want to at this point ... rosemary would be divine ... our girls just won't eat anything with herbs like that at the moment so I didn't add any this time! 7. 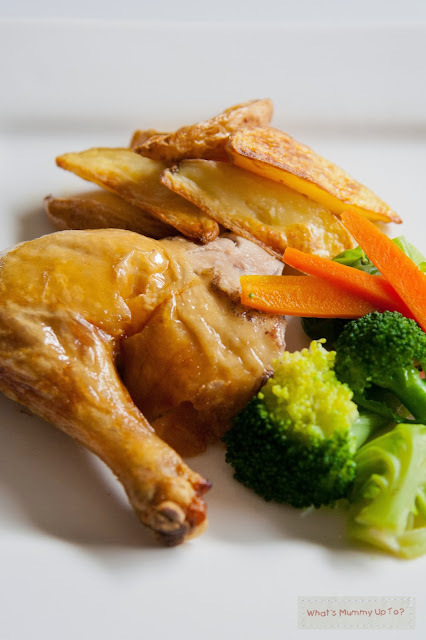 Once your chicken has done it's 20 minutes on high heat, turn the heat down to 200 degrees Celsius, and put the potatoes in too. Then cook both for a further 40 minutes. Makes sure you spike the chicken with a knife, either in the breast section, or the thigh and check that any juices coming out are clear (that is, not pink or red). That's how you know it's cooked! 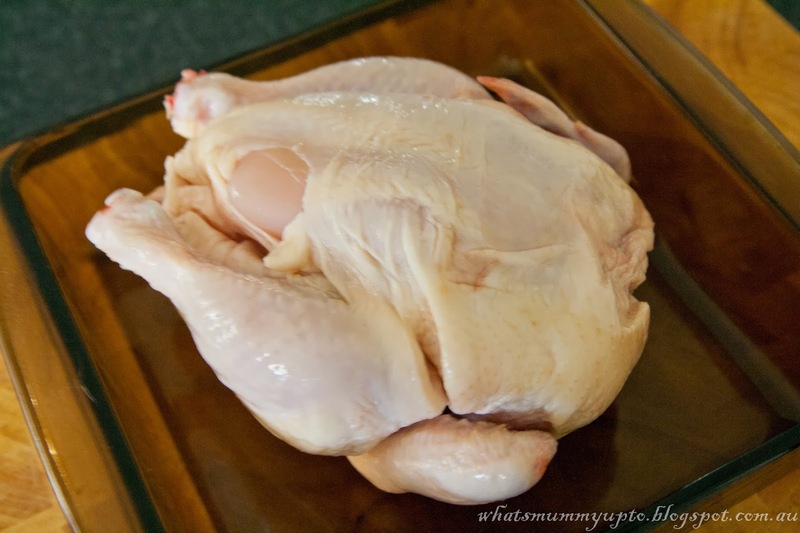 If your chook is a super-big one, you might need to leave it in a little longer. This is how amazing your chicken will look when it comes out of the oven!! Yum!! Of course, add your favourite steamed vegies on the side ... and if you really want to, I could forgive you for making a gravy to go on it too ... 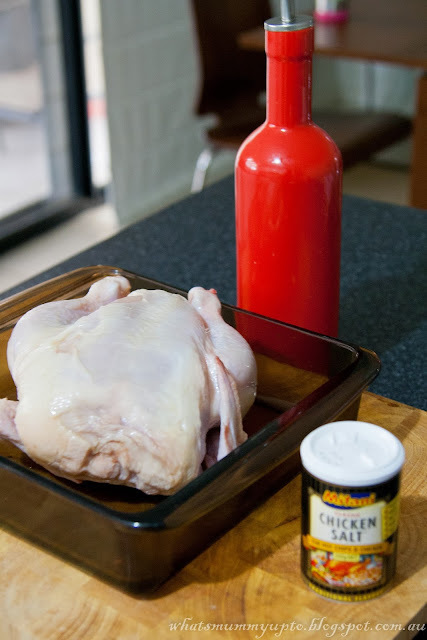 I personally can't stand that warm gloop, but go ahead if you're a fan ... oh, but I promise ... our chicken was super juicy and not even slightly dry without it! Anyway, hope you enjoy this one. And again, a massive thanks to Taryn of Wordstorm for asking me to review the Mitani Chicken Salt. As always, reviewing a product is so much fun, and be assured, all opinions are my own!